Chinchillas are active and curious creatures who have a lot of energy to expel in a small package. Toys and activities can help keep your chinchilla happy and healthy but it is important to also ensure they are safe. You may not think about dust baths as being toys for chinchillas but chinchillas get so excited to see a dust bath that it is just as fun as any toy would be. Dust baths can be made at home using a large bowl but cleaner options will be glass fish bowls and specially made dust bath houses for chinchillas. A very small amount of chinchilla dust is needed for your pet to not only help keep its coat healthy but to have some fun rolling around. Dust baths should only be offered two to three times a week. Like other rodents, chinchillas have teeth that grow continuously throughout their entire lives. Chinchilla teeth are kept trim and in good working condition by gnawing and chewing on things so this is a natural and necessary activity for pet chinchillas. Chinchillas often favor a variety of branches for chewing but make sure you choose a safe wood such as willow, apple, poplar, and aspen tree branches. Avoid branches from cherry, citrus fruit trees, redwood, cedar, and other evergreen trees. You can also provide a variety of wooden toys made from untreated wood. Many options abound in the small animal section of the pet store but even more can be found in the bird section. Manzanita branches are also good for chewing and some chinchillas will also chew on pumice stones or mineral blocks. 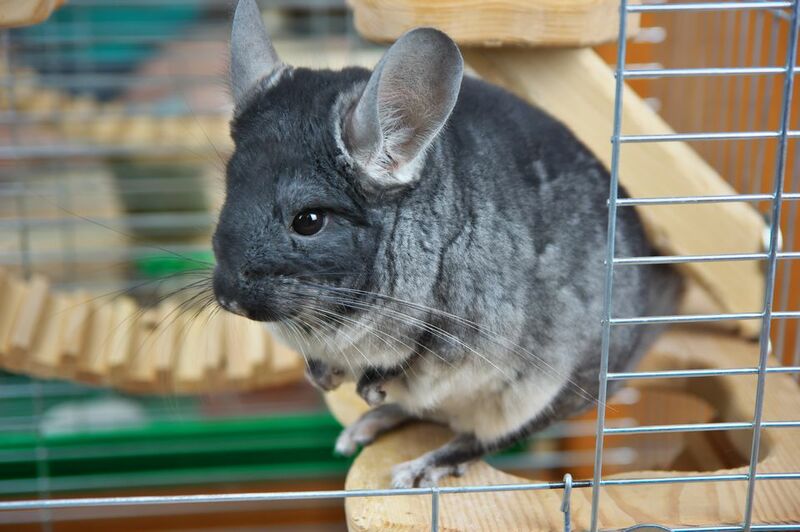 Chinchillas are very agile and love to climb so providing creative options in their cages. Some options include sitting platforms of different heights, ladders, large blocks of wood or bricks, perches, branches, and fabric hammocks. Arrange these climbing toys in the cage so that they are sturdy and won't shift or fall when your chinchilla climbs on them. Many chinchillas enjoy running on exercise wheels. These wheels need to be large and have a solid surface with no spokes. A small, wire hamster wheel is not large enough and not safe for a chinchilla's tail. Most wheels of this size come with a stand or can be mounted to a cage. Large enclosed balls for running around outside the cage should be used with caution. Since they do not provide good ventilation, they should only be used for short periods of time and out of direct sunlight. Avoid the small exercise balls designed for smaller rodents as these are not large enough for a chinchilla. Chinchillas appreciate a secure place to hide and also think it's fun to hide while playing with other chinchillas. Commercial pet rabbit or guinea pig houses can be used but you can also make your chinchilla a hiding place using PVC pipes, clay pipes, or clay pots. Even cardboard boxes can be used, although they will likely be chewed up and need to be replaced. PVC pipe will also double as a fun tunnel for your chinchilla to run through if you use a piece that is long enough. Chinchillas love to explore and this is the number one thing they will choose to do if allowed outside their cages. Exploring provides a wonderful opportunity for your chinchilla to exercise not only its body but its mind. Mental stimulation is just as important as physical exercise. Before you can let your chinchilla outside its cage to play you'll want to make sure it will willingly go back into its cage or that you can catch it. The last thing you want to do is stress your chinchilla by chasing it when it is time to go back to the cage. Playtime outside the cage is also a potentially dangerous time for your pet. Chinchillas are curious and many things are investigated by biting into them to see if they are edible. The natural curiosity of chinchillas means that you should have a room that is thoroughly chinchilla-proofed before allowing time outside the cage and close supervision is necessary. There should be no exposed wires or cords, places to get stuck in, or vents that can be accessed in a chinchilla-proof room.